Way back in July an old friend (that I haven't seen in YEARS, but we're friends on Facebook. That probably didn't need to be said, everyone is friends on Facebook!) proposed a crafty swap. She ordered a bunch of mini dominoes and sent me twelve. Ten were white and two were smaller black ones. Our only requirements were that we used six of them to make something for the other and that our deadline was the end of September. I played around some with the game pieces. One's missing from the picture because I had already started altering it! 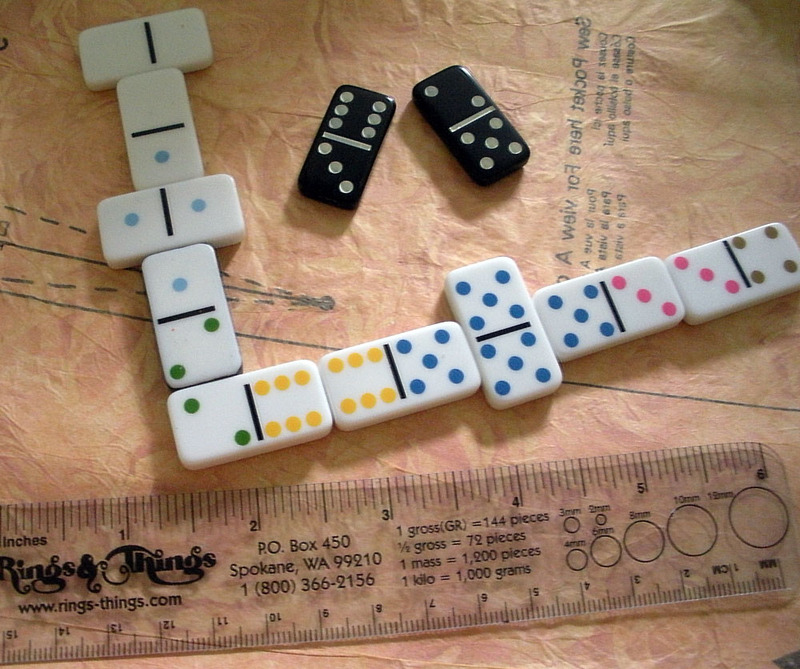 I moved those darn dominoes all over my desk before finally sitting down and just getting to it. Of course, some digging around the craft room and a trip to the craft store for inspiration and supplies was in order first. 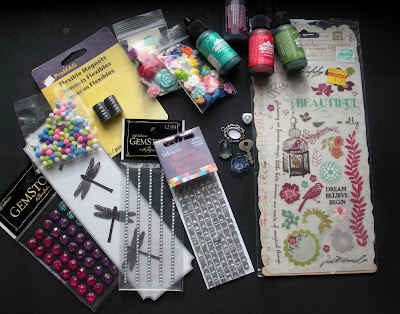 Some of the supplies I bought and pulled out for the altering process. I didn't near use all of them. I covered my whole desk with domino-altering fun. 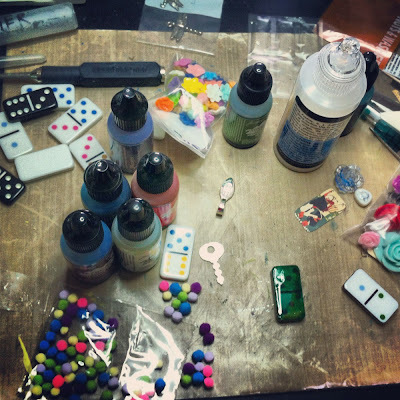 Messy desk is a sure sign of a happy crafter! 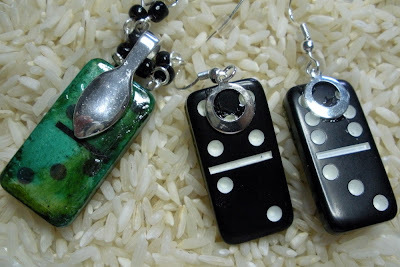 Rebecca (that's her name by the way) had requested at least two magnets and a pair of earrings made from the dominoes. That at least narrowed down where I would start. To complete the piece and keep it simple, I made a chain of simple loops with e-beads and wire. These earrings are probably my favorite pieces in the mix. I stamped dandelion images onto a dictionary page, cut the page to size, and glued them onto the smaller black dominoes. With a q-tip and some Distress Ink, I lightly colored the edges of the paper. A layer of matte Mod Podge sealed the paper. A small rhinestone was glued to the center before the whole top of the piece was coated in ICE Resin. 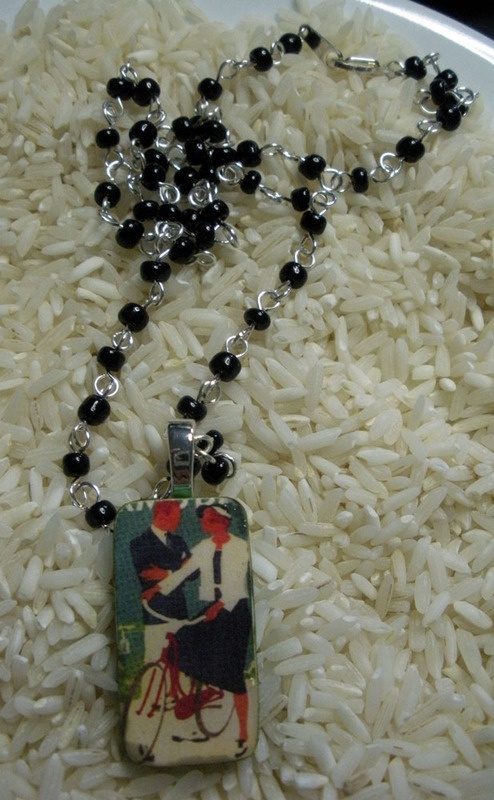 E-6000 glue was used to stick on the bails to the back of all the jewelry. 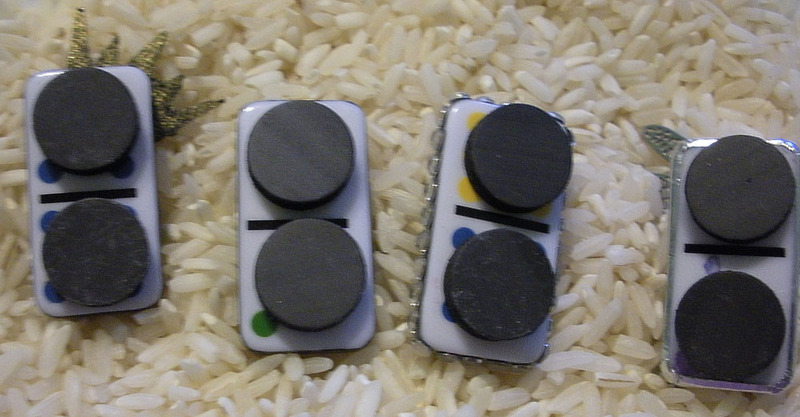 From there, I moved on to playing with the dominoes to create magnets. I really went crazy and used a large variety of materials to alter these. 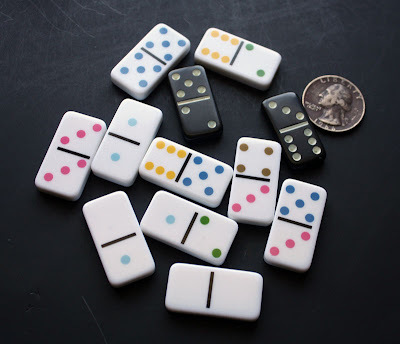 The domino on the left was altered with an image I had printed from from some of Dover's free sampler images. I colored it with chalk pastels and sealed it with the Mod Podge. The crown was a piece of Tim Holtz Grungeboard. It was painted with gold acrylic paint before the dictionary page was added and sealed. E6000 holds that crown on tight. The domino on the right was covered in strips of bright washi tape and sealed. A plastic flower was glued to the center. The sides of both of these were painted with a black paint pen and the tops were coated in ICE Resin. Domino #3 was coated in glue and several dustings of PearlEx Powder. A stamp with Staz on Ink was pressed onto the dry powder. 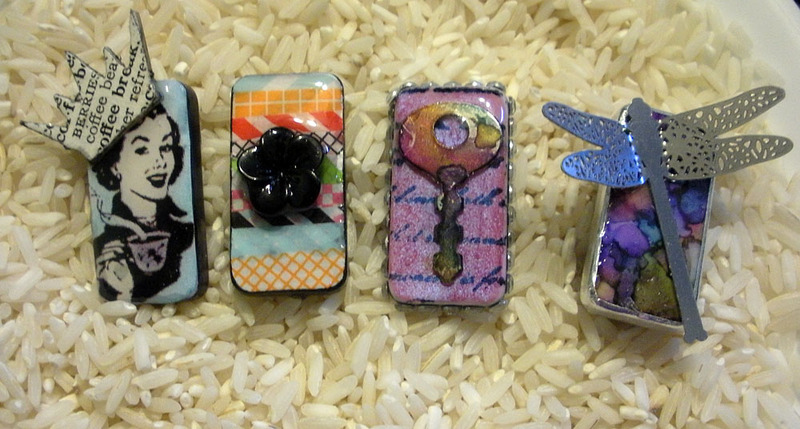 A small diary key was decorated with alcohol inks and then glued to the surface of the domino. 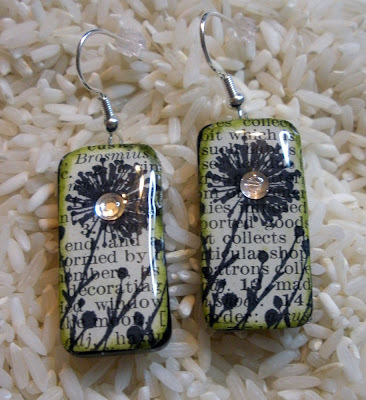 The edges were painted silver and wrapped with a strip of rhinestone stickers. The face was sealed with ICE Resin. The domino on the right was altered with more alcohol inks before a layer of Glossy Accents sealed the domino. 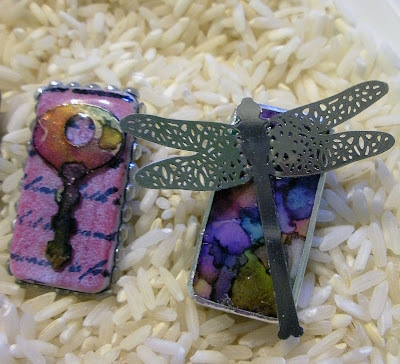 The 3D silver dragonfly was glued to the top and a small strip of aluminum tape covers the edges to mimic soldering. Small magnets were glued to the backs with E6000. 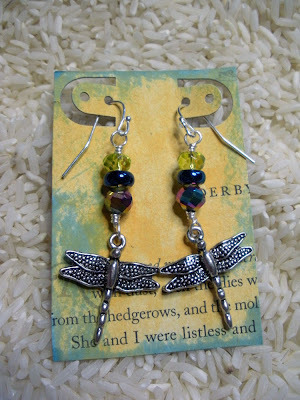 In addition to these pieces, I also made Rebecca a pair of dragonfly earrings and a decorated box. 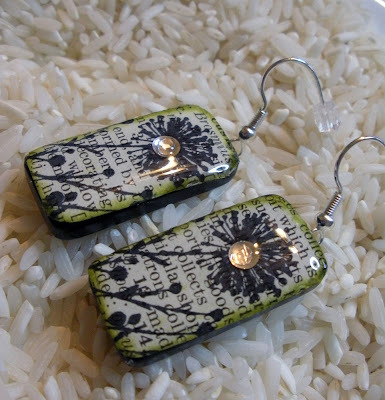 Here are the earrings. In my haste to get these items in the mail, I failed to take a picture of the box. It was a play on the domino theme and the paper mache box was covered in "game papers" (sudoku, crossword puzzles, jumbles, etc.) The feet were upside down monopoly houses and on the top was a die and a domino transformed into a lid pull. Fun stuff! Rebecca still has plenty of time to alter her dominoes. I'll make a point to show off what she made just as soon as I get them. In the meantime, I'm anxious to get back to just playing with my beads for a while. At this point I know I've bored you all to death so I'll leave it at that. . .well except to ask How would you have altered these? what a great idea! oh so very crafty of you!! Cynthia- Thanks! It was actually Rebecca's idea to do the swap, I just played along. 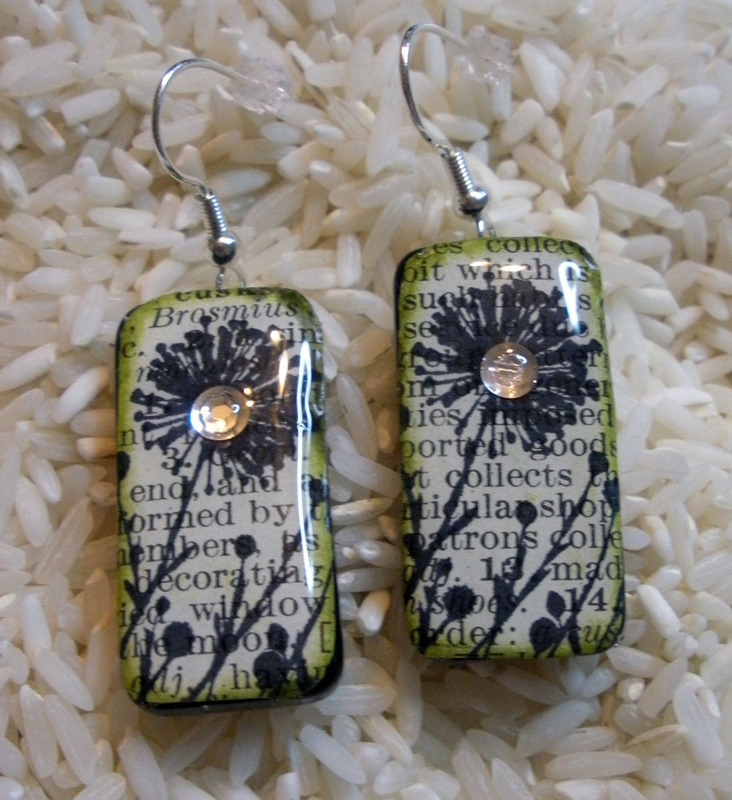 I was fun making something besides jewelry and getting to play with all my other supplies. I still had more ideas, but needed to be finished so I could move on to the next item on my list. It's never-ending isn't it? Anyway, I'm so pleased that you approve! Wow, everything you made is fabulous! My favorite is the first pair of earrings with the rhinestones. And the magnets are darling! While I love making jewelry, I have come to realize I'm not very good at altered art of any kind. No matter how hard I try it always ends up looking like it was made by a preschooler. these are great! 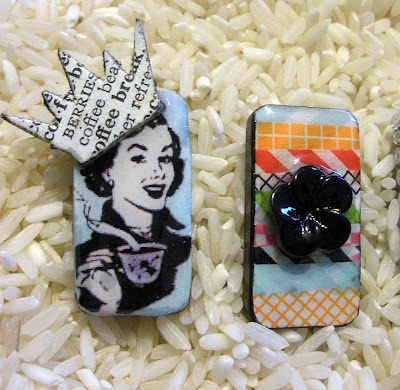 if i saw those earrings in a shop i would squeal, figure out who to buy them for, buy them, and after a few days decide to keep them for myself :-D love the coffee queen magnet too. i would not even begin to know how to alter these. every time i go to the craft store i look at the alcohol inks and embossing powders & gilders paste (is that what they are called?) and want to buy but haven't a clue as to what i would do with them. i need to spend some time in Crafty Hope Studio and learn several things! These are crazy pretty! 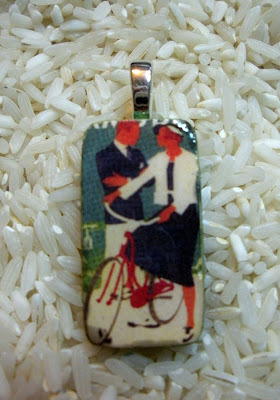 The dandelion earrings, and the bicycle lady are my favorites! Love your creativity - it's hard to believe their made w/Dominos! !